Predictable crime movie where you can see every move coming. A Scotland Yard Inspector goes undercover to catch a jewel rackeeteer. Don’t waste your time. 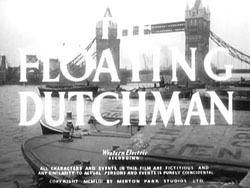 The body of a Dutchman is found floating in the river. Scotland Yard thinks it’s the lead they need to nab racketeer Victor Skinner. Alex James is sent in to get the goods on him. James is given a passport with his phony name and proof he’s just gotten out of prison. James goes to Skinner’s club and parks at the bar. After hearing the band you’ll wonder why anyone would go there. Bad judgement on the film makers part. James notices Rose. She works there and is supposed to dance with the customers. Victor’s partner, Snow White, can’t leave her alone. Victor tells her to get back downstairs. He meets James and is interested in doing some business. He leaves and James hears a commotion from downstairs. The band’s guitar player is passed out. He’s Rose’s drunken brother Philip. She gets him out of there and James is outside and helps her. At Philip’s place James finds a cigarette case in Philip’s pocket. When Philip comes to he tells him to keep it in his pocket. Back at Victor’s, Otto the fence is haggling with him over some stolen jewelry. The cigarette case was part of package. It’s missing. James comes by and he tells Victor what happened at Philip’s. Later Victor gets the case from Philip and warns him to keep his mouth shut. He hints to Snow White that he may have to take care of him. James get some hot merchandise from his boss and goes with Victor to Otto’s house. Otto refuses to buy the stuff from James. He has a list of the latest stolen jewelry from the police department and tells James it’s too hot. Now Victor and James are pals. Time for a robbery. Victor, James and Snow White are going to an apartment where, thanks to a headwaiter at an expensive joint, they know is empty because the residents are out and in the restaurant. Before leaving Victor’s, James writes down a phone number and a cryptic message and asks Rose to call the number. The trio are on their way. The movie tries for a clever turn but you can see it coming without even thinking about it. This entry was posted in British Movies, Crime-Mystery-Spy, vintage movies and tagged Movies. Bookmark the permalink.